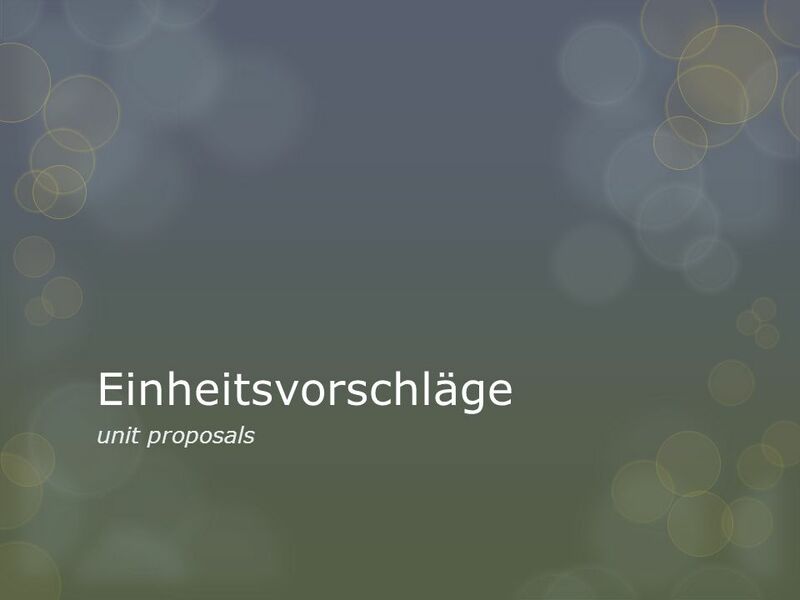 Einheitsvorschläge unit proposals. 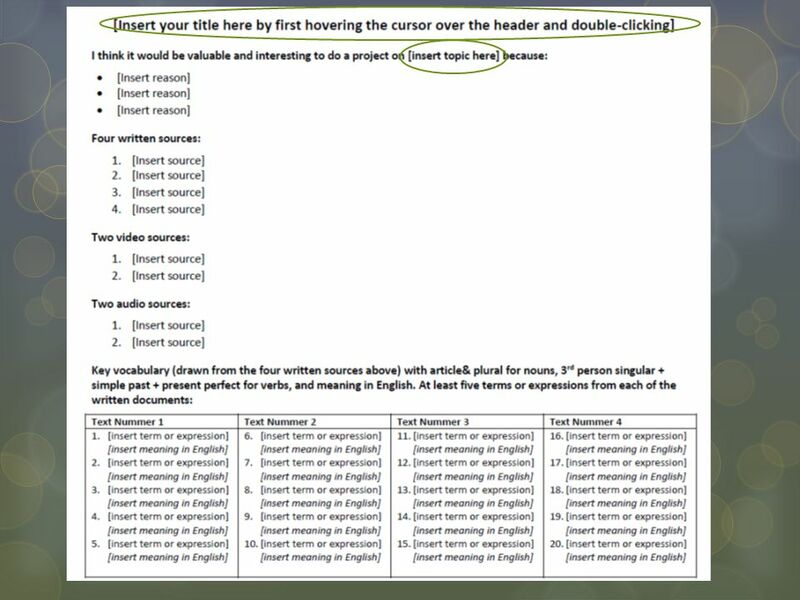 Was ich von euch erwarte  Ein paar Worte zur Überzeugung: I think it would be valuable and interesting to do a project. 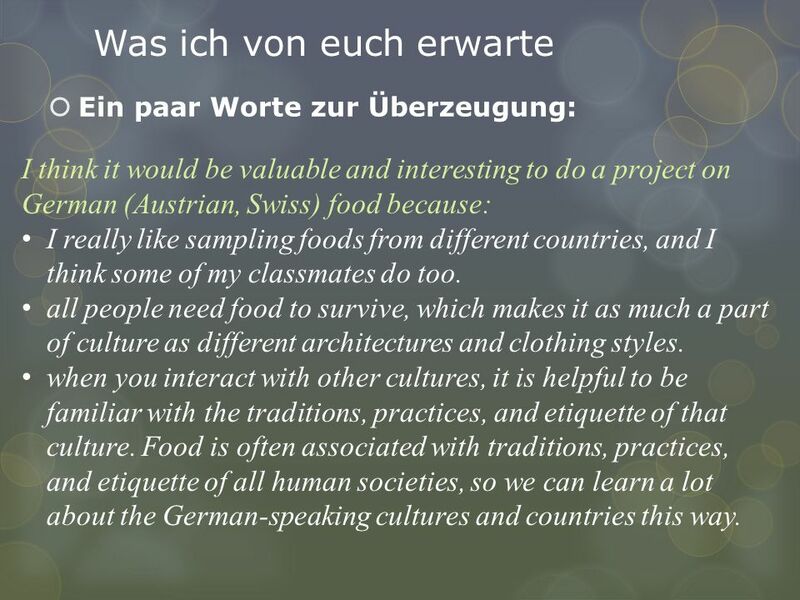 3 Was ich von euch erwarte  Ein paar Worte zur Überzeugung: I think it would be valuable and interesting to do a project on German (Austrian, Swiss) food because: I really like sampling foods from different countries, and I think some of my classmates do too. all people need food to survive, which makes it as much a part of culture as different architectures and clothing styles. when you interact with other cultures, it is helpful to be familiar with the traditions, practices, and etiquette of that culture. 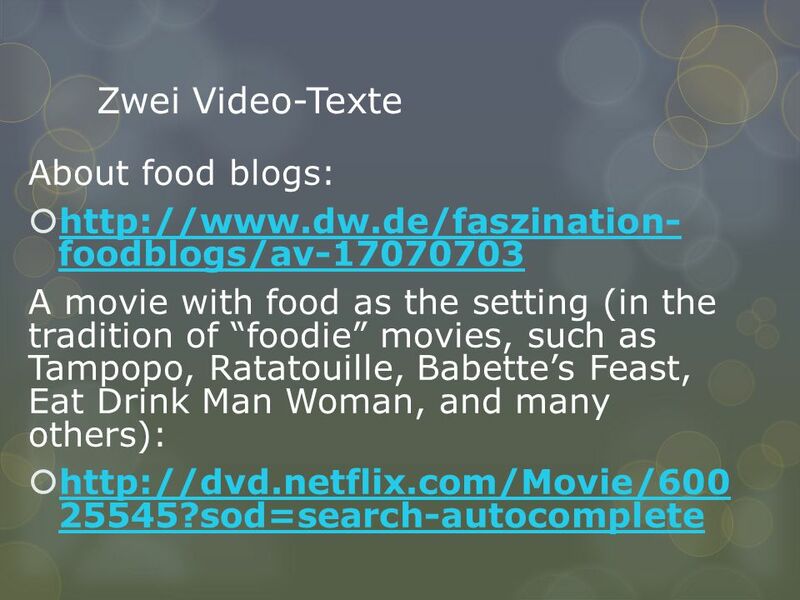 Food is often associated with traditions, practices, and etiquette of all human societies, so we can learn a lot about the German-speaking cultures and countries this way. 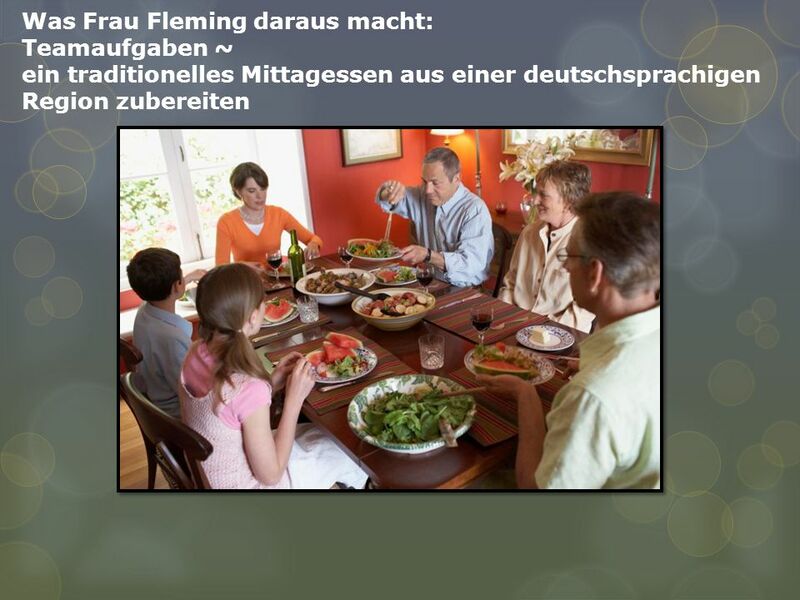 8 Was Frau Fleming daraus macht: Relevance:  Many Americans are beginning to look closely at our food production (industry, supply), often questioning our current practices.  When we question currently accepted norms (habits, practices), it is helpful to examine those of other communities.  When we use the best and discard the rest, we improve conditions. 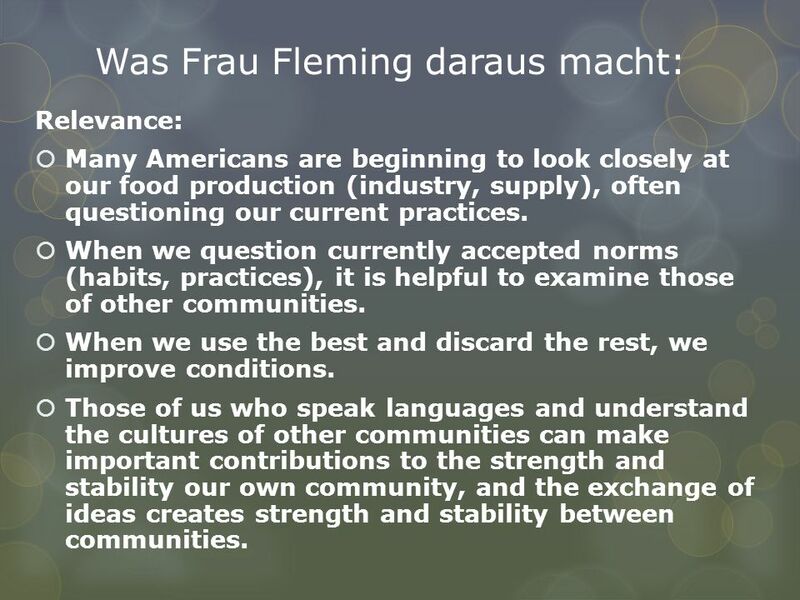  Those of us who speak languages and understand the cultures of other communities can make important contributions to the strength and stability our own community, and the exchange of ideas creates strength and stability between communities. 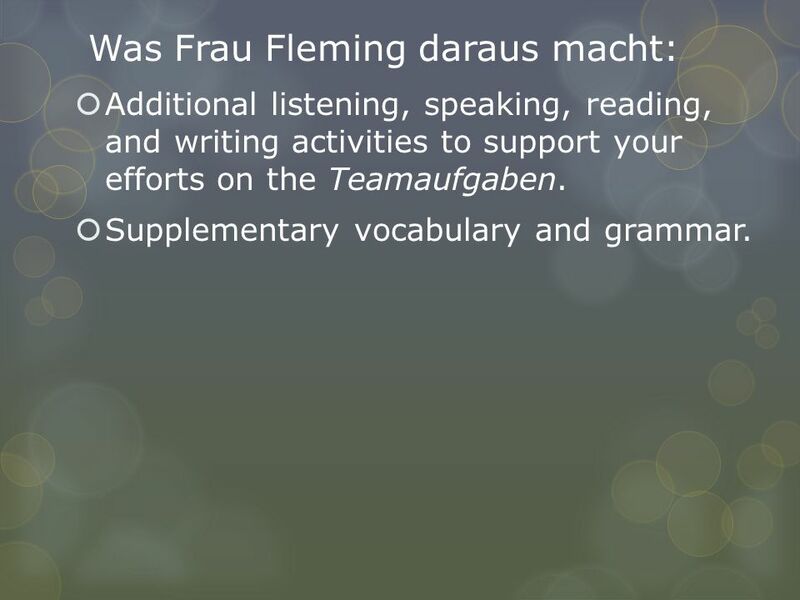 13 Was Frau Fleming daraus macht:  Additional listening, speaking, reading, and writing activities to support your efforts on the Teamaufgaben.  Supplementary vocabulary and grammar. 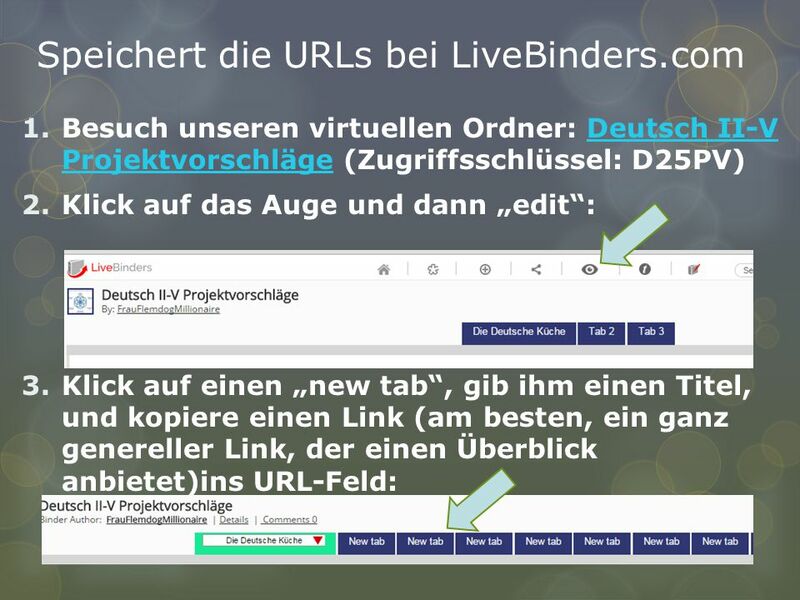 15 Speichert die URLs bei LiveBinders.com Jetzt hast du einen tab für deine Projektidee! 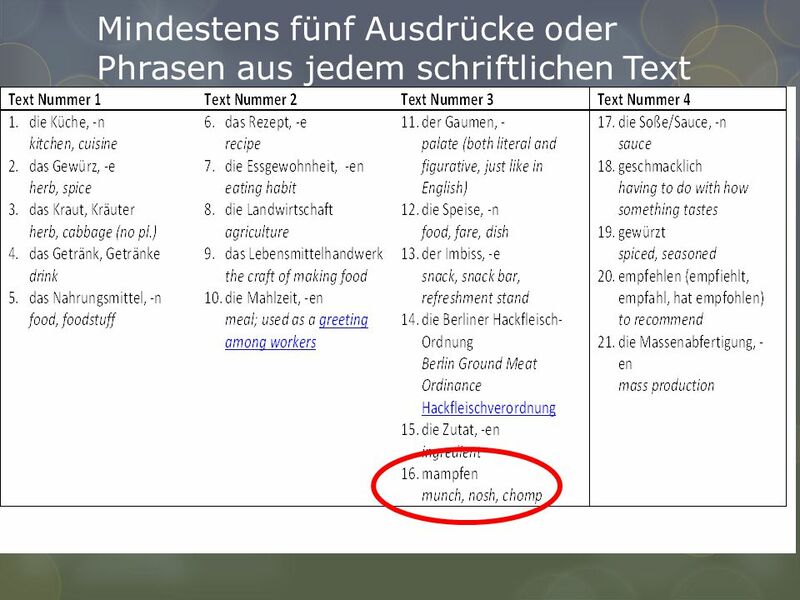 4.Dann klick auf das rote Pfeil und „add sub tab“ 5.Gib dem „sub tab“ einen Titel und kopiert einen Link ins URL-Feld. 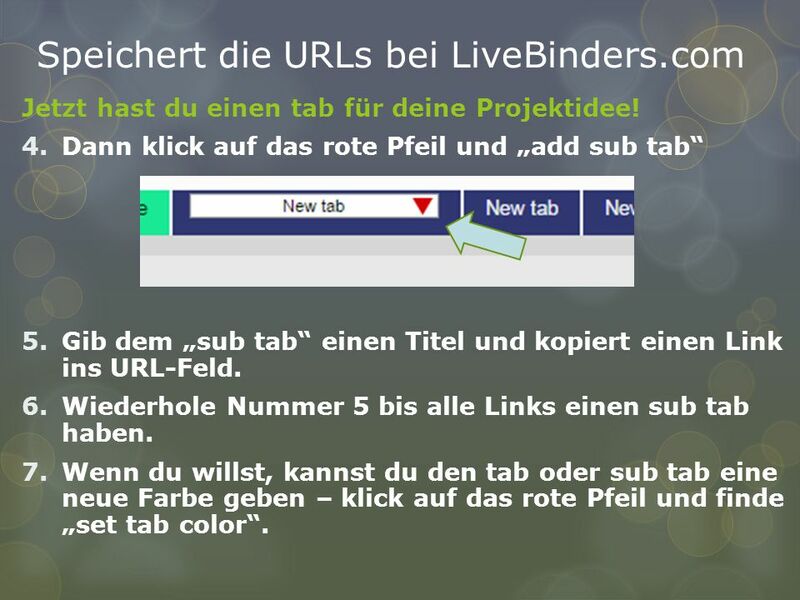 6.Wiederhole Nummer 5 bis alle Links einen sub tab haben. 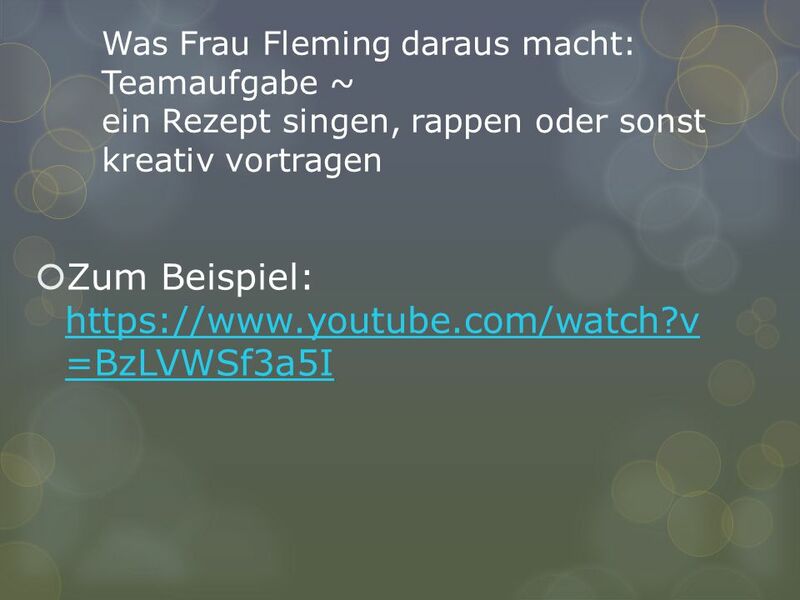 7.Wenn du willst, kannst du den tab oder sub tab eine neue Farbe geben – klick auf das rote Pfeil und finde „set tab color“. 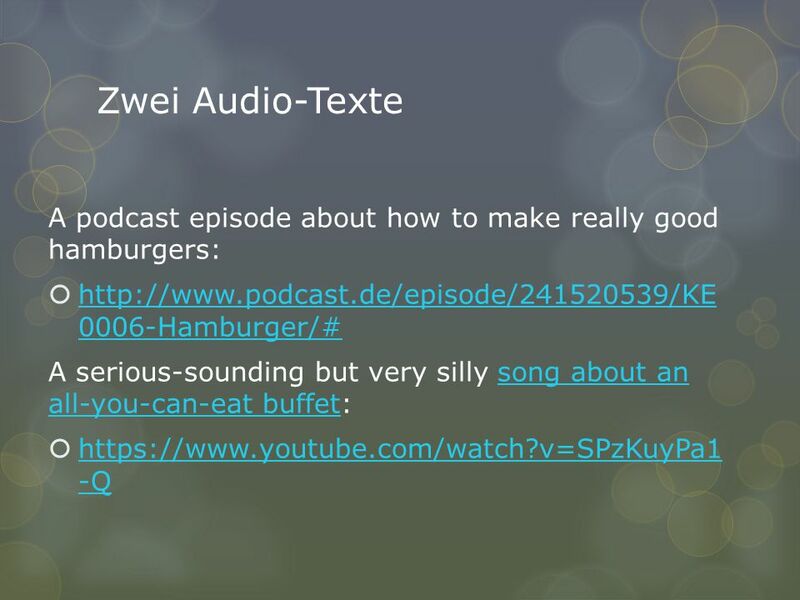 Herunterladen ppt "Einheitsvorschläge unit proposals. 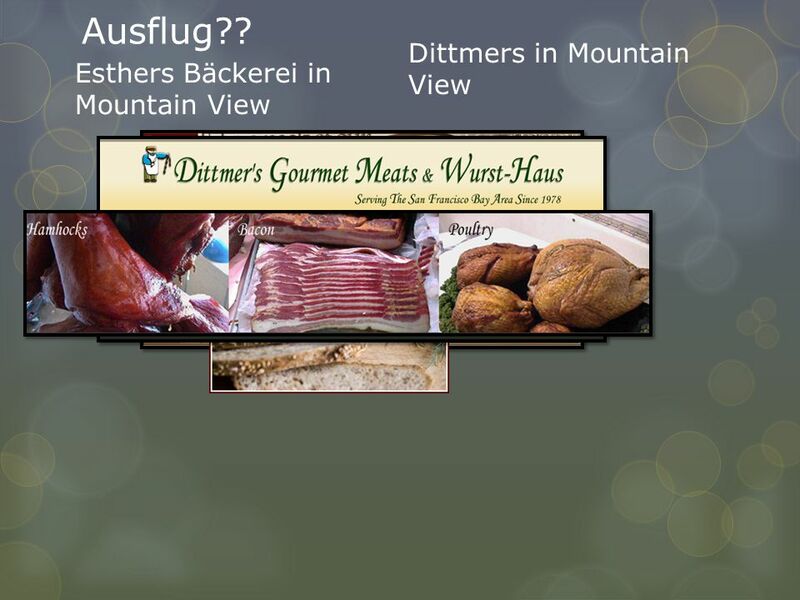 Was ich von euch erwarte  Ein paar Worte zur Überzeugung: I think it would be valuable and interesting to do a project." 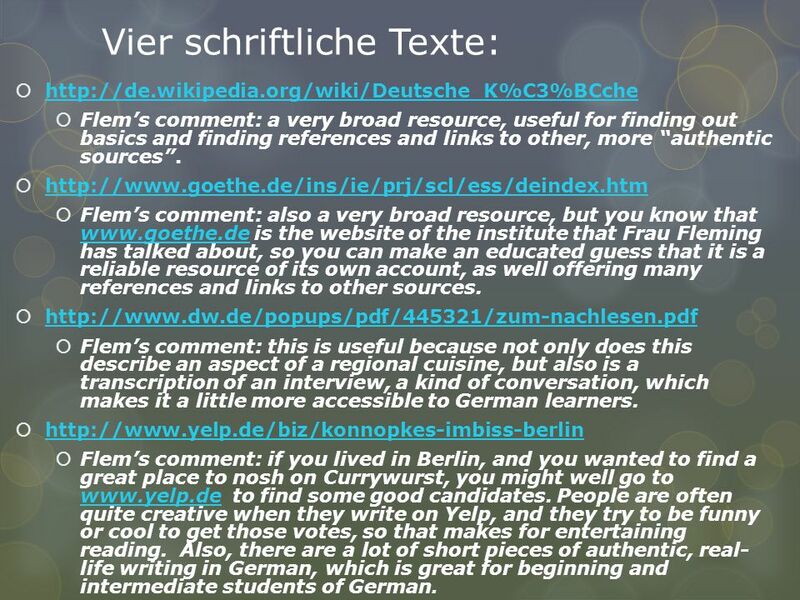 Die Fächer Objektiv; To talk about what you study MUST be able to say what you study SHOULD be able to give opinions on the subjects you study COULD use. Im Angebot. Was für ein Schnäppchen! Im Angebot. im Sonderangebot Ausverkauf.